Prior to becoming C.E.O. of Louroe Electronics - a domestic manufacturer of audio monitoring technology - Richard Brent worked for Caterpillar's Solar Turbine, Inc., for over 24 years, the last 12 years of which were based in Washington D.C. to manage Federal and State Government Relations. Now the C.E.O. of a top tier integrated technology manufacturer, Richard has utilized his experience in consensus-building, quality management, and organizational performance to manage and grow his company's deliverables as the World Leader in Audio Monitoring Technology. His organizational guidance has spurred Louroe Electronics technologies to participate in a wide range of domestic and international government security initiatives, medical research facilities, commercial A/V security systems, and law enforcement. SecurityStockWatch.com: Please give our audience an overview of your background and your role at Louroe Electronics, Inc.
Richard S. Brent: Having been in the workforce for over 40 years, my experiences have taken place in manufacturing management, program management, U.S. Government contracts, responding to solicitations and managing award completion, human resources, strategic sourcing, and new product introduction & commercialization. The last 12 years of a 24 year career was as Director of Government Relations for the leading manufacturer of mid-sized industrial gas turbine technology used in the energy sector, a wholly owned subsidiary of Caterpillar, Inc. I joined Louroe in January, 2010, retiring from my position in Washington, DC and resettling in Greater Los Angeles. Founded by Louis Fisher Weiss in 1979, Louroe has evolved to take its place as the worlds leading manufacturer of dedicated audio monitoring technology. We serve the many faceted applications that require capturing sound with professional quality and using the results to improve life safety and security. As of December, we having shipped over ¾ million Verifact® microphones to over 30 countries, with satisfying results for those who deploy our product. As CEO, my principle effort is to strategically develop the corporate response to the market demand for need satisfaction from our consumers. We are audio oriented, and all our products spring from a deep understanding of expectations for product performance and in todays world, the quest for interface and interoperability with a panoply of technologies for the verticals within the security marketplace. 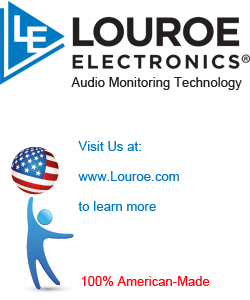 SecurityStockWatch.com: Louroe's product line is quite comprehensive with solutions that include Audio Monitoring Kits, Microphones, Audio Base Stations, Speaker/Microphones and Accessories. Please give us an overview of your Product Line. Any new products on the horizon? Richard S. Brent: Louroe started over 30 years ago with microphones that were able to capture an audible signal and send it up to 1000' away to a base station designed specifically to receive the signal and amplify it for the person monitoring the audio 'zone.' Over time, applications were identified in security, law enforcement, hospitals, casinos, Gasoline stations, dry cleaners, quick service restaurants, and beyond. With the advent of digital technology, and many applications deploying technology that is interoperable with internet protocols, Louroe has evolved it offerings to support two way hands free audio, Listen & Talk communications that ties to CCTV and is used as part of a system that is designed to prevent security breaches rather than captures the incident, leaving it to forensics to determine what took place. Product of the future for Louroe will reflect the demand response for audio oriented digital signal processing and using the backbone of the internet to integrate microphones & audio technology with digital security equipment. Critical to understanding Louroe, we focus on security and life safety audio, and not the audio that is used by the performance industry. Our customer service response team assists in the selection of componentry based on system requirements, application, physical site considerations and performance expectations. SecurityStockWatch.com: What are your key target markets and what is Louroes value proposition in these challenging economic times? Richard S. Brent: The application of audio monitoring enables many options for the professional integrator of security systems. Within the security marketplace there are several vertical sectors such as access control, perimeter management, loss prevention, and life safety. Outside security industry uses the opportunity for is virtually endless. Audio monitoring for patient services such as sleep treatment labs, and operating centers, family programs, such as child protective services are another non-security application. The Entertainment Industry such as casinos and theme parks. House of worship facilities are also a market for our products. Louroe Electronics provides integrated security solutions for a plethora of commercial environments. Louroe sells its product based on a Best-Value proposition. It is the combination of product features, durable performance, technical support, and fair market pricing that creates best value. SecurityStockWatch.com: We understand that Louroe products are presently in use in over 20 countries. That is truly quite impressive in the current business environment. What are the market drivers for Louroe solutions? Richard S. Brent: To go from a closed circuit, video monitoring system to a total security solution is the key driver for the increase in use of audio monitoring technology. The more assets you have, the more you want to protect those assets. Protection implies prevention, and people want to know how to prevent incidents rather than record them. The market calls for audio as a means to capture incidents and react quickly. SecurityStockWatch.com: Are there 1 or 2 success stories in the US market you'd like to discuss? Richard S. Brent: The success story that comes to my mind almost immediately in the U.S. marketplace is one of informing the professionals in the industry on the use of audio monitoring and the law, both Federal and State. Team Louroe has worked hard to understand the implications of the audio monitoring statutes, and how to comply with them while commercializing audio monitoring technology. Our business reflects the growing understanding from the businesses and markets we serve. One more success story that comes to mind is the pleasure I receive when reading project specifications from around the country that call out Louroe Electronics as specific technologies for the satisfaction of performance. SecurityStockWatch.com: What about international markets, care to comment on some "wins" in those regions? Richard S. Brent: Louroe focuses on supporting a worldwide market, providing products and services around the globe. Our activities complement the pull from the market from any given country. SecurityStockWatch.com: Can we drill down into audio monitoring and the law for a moment? This is surely an important concern for your customers. Please give us a brief tutorial regarding the Federal, State and Local laws that come into play with audio monitoring? Richard S. Brent: In the United States, we have the Federal Law, and almost every State has a statute addressing audio monitoring. All of these regulations and statutes revolve around the expectation and management of privacy. The expectation of privacy can be removed by posting notice that audio monitoring takes place on the premises. 38 states require that at least one party to the monitoring/recording of audio be aware that the activity is taking place. 12 states require that all parties being monitored, be given notice. Louroe assists in the management of posting notice of "Audio Monitoring on Premise", in many ways. The most common one seen is the provision of a decal with all our Verifact® microphones that are used by the professional to post notice and remove the expectation of privacy. there are bound to be differences from country to country about audio monitoring and the law, but, in general what is the legal framework? Richard S. Brent: Much like the United States, other countries and regions, such as the EU, practice data protection rights. Few countries have no practice or protection. As a side note, monitoring sound is not the same as recording that same sound. While monitoring can take place, recording and using that information takes on a whole different set of requirements. Louroe designs its equipment for "overt" application, and as the manufacturer has an expectation that the professional around the world who uses this product knows how to manage that expectation. SecurityStockWatch.com: What resources are available on www.LOUROE.com regarding audio monitoring and the law? Richard S. Brent: We hold an immense focus on our customers' understanding of the proper application of our products by providing multi-media resources outlining the legal necessities of audio monitoring. Louroe.com is one of those resources. Here you can read about lawful monitoring as well as see annotated Federal statutes on Lawful Monitoring, Implied Consent, Expectations of Privacy, and Legal Compliances. Visitors to our site will also find URL links to Federal and State Laws to specify how to legally apply their audio monitoring device. SecurityStockWatch.com: Any other online resources at www.LOUROE.com you care to mention for your customers and the trade? Richard S. Brent: I'd love to, but even more so, I'd like to give our customers a small expectation of what's to come in 2013. Our site is currently one of our greatest resources for product technical information, integrations, and product Illustrations. In addition, we provide product information, a list of product-specific applications and our directory of global distributors. As a company focused on expansion, Louroe has looked to developing its site to meet the growing demand for audio monitoring security system integrations. I won't give away too much, but you can expect to see Training Certification Programs, downloadable product catalogs, and an all-around aesthetic face-lift in 2013. One more thing! Don't forget to view our Blog for monthly updates on the utilization of audio monitoring in real-world circumstances, articles on audio monitoring developments, and more! SecurityStockWatch.com: Thanks again for joining us today, Richard. Are there any other subjects you'd like to discuss? Richard S. Brent: As I previously noted, Louroe is 34 years young in this market place. Over the years, we have been working to accept the responsibility of an increasingly active role in the marketplace. This has appeared specifically with our National Trade Association and with the community who seeks audio monitoring technology as a critical component of the security system for today and tomorrow. I want to thank SecurityStockWatch.com for the opportunity this interview affords us in this effort.